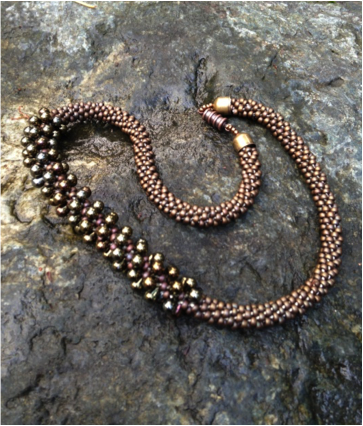 Kumihimo braiding is a relaxing way of making beautiful and innovative jewelry. This class will introduce you to the basic tools and supplies specific to this technique and get you started on your first gorgeous braided cord bracelet. Ending techniques and addition of beads will also be covered. A perfect lightweight and compact project for travelers!!! Teacher Bio: Chris Eisenberg discovered beading while recovering from an accident and the resulting traumatic brain injury. Beading was her therapy and credits it for helping her become whole again. Chris has a doctorate in classical piano performance from the University of Northern Colorado and am a performance coach and collaborator at Central Washington University. She has previously taught workshops at the Autumn Artist Retreat and in the Iron Mountain Arts studio near Port Gamble.